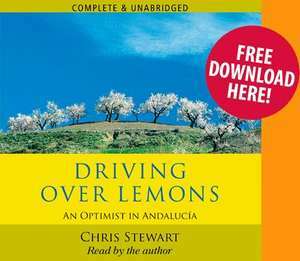 Drving Over Lemons Audiobook read by the author himself, Chris Stewart. An excellent book I had it in print, but just downloaded it! Thoroughly enjoyable read, got to be a cracking listen too! Excellent. More authors should do this if they have more than a few books out. Give one away and let the masses advertise the author. I'll be checking this out and if I like him (haven't read anything by him before) I'll buy more just for doing this. A great book. Read it years ago when on holiday in NZ. I will relive those days whilst driving to and from work. Hey, great find. I read and enjoyed Mr Stewart's 'Three Ways to Capsize a Boat' so this is a nice little freebie. Great book, as are his other titles, looking forward to hearing them read by himself! Many thanks for posting. Looking forward to listening to the book. Plenty of positive reviews.